Even before I set off on this London adventure, I knew that there were differences in the way English is spoken in America to how it’s spoken here in England. (Mainly just the accent!) But as I’ve realized in living here the past month, there are actually A LOT of differences in the words and phrases that are used back home, that aren’t used here! There are some that my British friends have never even heard of before! There are even differences in the way that Brits and Americans pronounce the same word, like “fillet,” and it’s not just a “potatoe/potatoe, tomatoe/tomatoe” difference. I got back yesterday from my Adventure Weekend in Lake District National Park, which is in northern England about 50 miles south of Scotland which was a 6-7 hour bus from from central London. This weekend trip was organized and included in my IFSA-Butler program, and about 150 students came! We left Friday morning at 10, and got to the Barrowdale hostel at around 6pm. The hostel reminded me of going to sleep-away girl scout camp back in the states, with the bunk-beds and shared bathroom facilities. The hostel provided us with all of our meals for the weekend, FOR FREE. We had home cooked traditional meals from around the region that were surprising really delicious. I definitely didn’t go hungry. Saturday morning saw the beginning of our extreme activities. We got a jump start to the day by waking up at 7:30 am, in order to eat breakfast and be at the Glaramara Outfitter center by 9 am. My first activity was gorge scrambling. I didn’t really know what to expect, but one of the guys in the program, Terry, said that it was his favorite activity that the center offered. I was a little apprehensive at first since I was going to climbing through a gorge, which meant water. And in northern England, lets just say it is definitely not warm. Thankfully, the center provided us with lots of warm gear which included: a fuzzy, fleece onesie, waterproof pants, a waterproof jacket, Wellies, and of course a helmet. There were about 20 students in the group, Julissa, Kelly, and I obviously lead the pack during the scramble. 🙂 Gorge scrambling is literally like rock climbing through the water. We were hiking up the stream, had lots of points of contact, were climbing up waterfalls, and army-crawling through tight tunnels. I had some bumps and scratches by the end of the hour and a half activity, but it was definitely worth it. I wish I would have brought a waterproof camera, because the view from inside the gorge at the section we scrambled in was so secluded and beautiful. 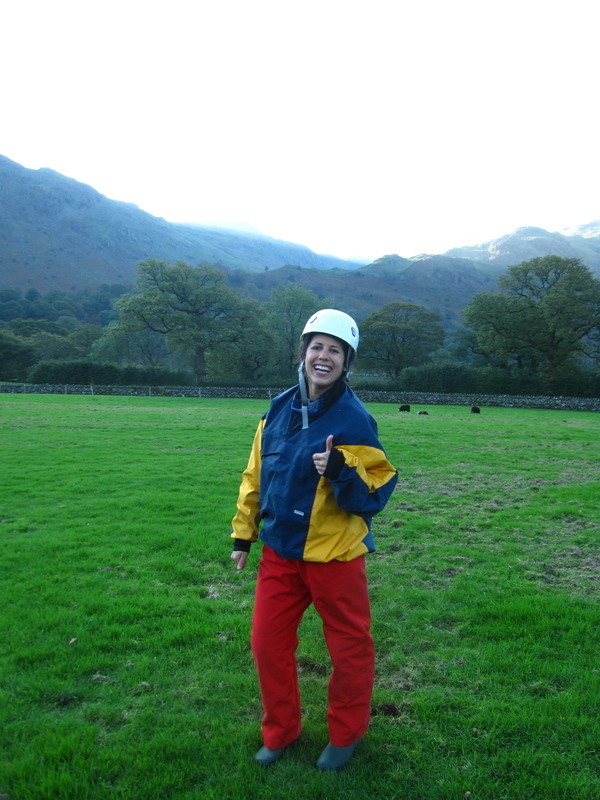 In my gorge scrambling gear! After we got back from the gorge scramble, changed into some dry, warm clothes and ate lunch, we were off to our second activity! Julissa and I did the Via Ferrata, which is Italian for “by way of iron.” For a little background history, the Via Ferrata was used by the Italians to navigate throughout the gorge to different mines, and was also used by the army in order to have an advantage over the enemy that would be passing through the bottom of the gorge. The Via Ferrata was definitely my favorite activity of the weekend, and gave me the ultimate adrenaline rush! We wore harnesses that were attached to a cable that ran along the mountain, and used what looked like big iron staples as places for our feet to step. I was definitely freaked out at first, being 2,000 ft high in the gorge, but after about 5 minutes I got really comfortable and definitely enjoyed myself. At certain points, we were able to unhook ourselves, and walk through some of the old slate mines. The whole experience lasted about 2 hours, and we ended up on top of the mountain and had the most breathtaking, 360 degree view. I have no words to describe the view, but I felt on top of the world. Apparently, the region of the Lake District that we were in, is the wettest part of England. We lucked out (thanks to Julissa’s good weather bubble) and had nothing but gorgeous sunshine! This weekend, I’m staying put in London and plan on having no plans. Maybe I’ll even get some homework done….? PS- I’ve uploaded some new pictures for the weekend, so check them out the Pictures tab! The Tres Amigos go to Barcelona! 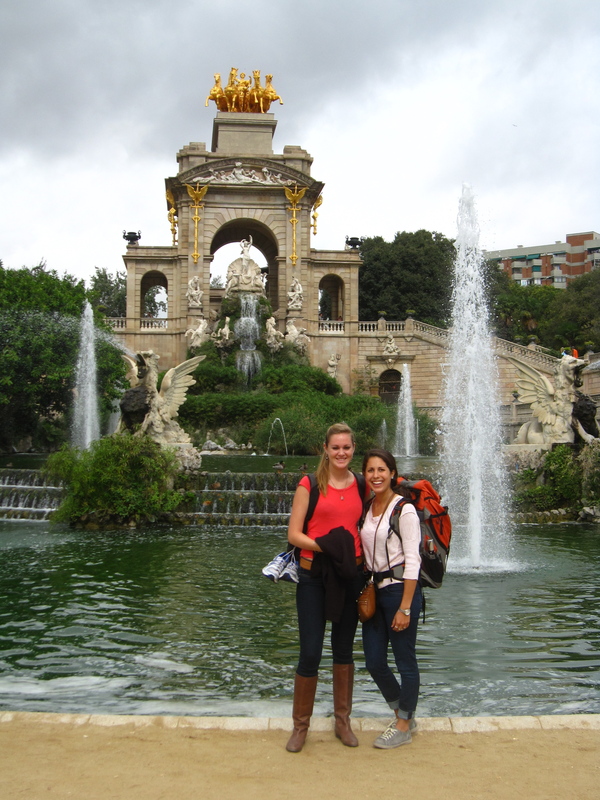 Julissa, Kelly, and I embarked on our first trip this weekend, to Barcelona! We left for Gatwick Airport at 3:30 in the morning, because we had to catch the train to take us to our 6:55am flight! We arrived in beautiful Barcelona at around 10:30am. Julissa’s family friend, Nick, was letting us to stay in one of his hotel rooms because he was in Barcelona on a business trip, but we couldn’t go to the hotel until 5 pm. So, the tres amigos set out to explore Barcelona by foot! On Friday, we walked for literally 7 hours all around the city. The bus from Barcelona’s airport dropped us off at Plaça de Catalyuna from where we walked down La Rambla which had a bunch of tents and stands that sold gelato, flowers, leather goods, and of course FC Barcelona gear. We were still carrying our travel bags with us, so I felt like a true backpacker! We stopped and got lunch at a cute little tapas bar that we found hidden within the narrow winding streets of the Barri Gotic area of town. While walking around after lunch exploring the small narrow streets, we stumbled upon the Santa Maria del Mar church. Entrance was free, and it was a beautiful little church that had tall, dark, vaulted ceilings and stained glass windows. On our long hike to the hotel, we walked through Parc de La Ciutadella, and found this amazing, tropical-like fountain in the middle of the park! We finally made our way to the hotel. after stopping by the beach, and met up with Nick. We went out for dinner to a cute little outdoor restaurant, El Glop de La Rambla, where I had my first ever sangria and seafood paella! Let me tell you, I could eat seafood paella for days! I had never had it before, and trying it in Spain was definitely the right choice. That night after dinner Kelly, Julissa, and I went out to a hole in the wall bar called “Chupitos,” which is spanish for Shots. The bar had over 580 different types of shots, from the Harry Potter shot to the Boy scout shot. The bar is an experience in and of itself, the bartenders put on a show for each of the different shots, which usually included setting the bar on fire. The next day, us girls and Nick decided to do the tourist-y thing and took the open top bus tour around Barcelona, and got off at the different sites. We first went to the Picasso Museum which was in the Barri Gotic district. It was a cool experience walking through the exhibit and seeing how his style changed over his lifetime. The museum even had on a special display some works by Van Gough and Cezanne! After the museum, and an AMAZING fish lunch down by the beach, we made our way over to the Temple de La Sagrada Familia. The basillica’s construction began in 1880, and still is not finished! But still, I was speechless and I took my tour throughout the amazing church. Sagrada Familia is a beautiful, modern church and is unlike any gothic or classical church I have seen. Antoni Gaudi, the Catalan architect who designed the church, really wanted to make use of the Mediterranean light and the way he utilized that was through the infinite amount stained and clear glass windows. It creates a breathtaking effect, as well as making it easier to appreciate the highly detailed architecture through the church. The two outside faces of the church were designed in two different ways. The north face of the church is dedicated to Christ’s birth and shows signs of life and happiness, while the south face depicts his death and resurrection. Visiting the Sagrada Familia was definitely one of the main highlights of my trip to Barcelona. 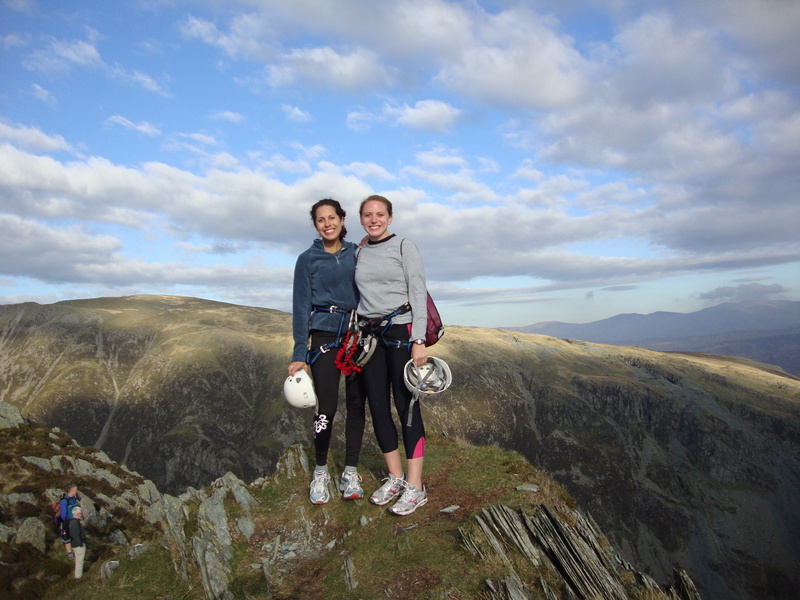 Next weekend, IFSA-Butler has organized a trip to the Lake District which is at the very north of England, where we will be hiking, gorge scrambling, and doing a bunch of outdoor adventure activities. I’m excited to get outside the city of London and have the chance to visit other parts of England. Like in the United States, there’s more to the country than just New York City. Can’t wait to keep you guys updated! I am done with my first week of classes at Queen Mary. I had my first Health Psychology class, which really seems like it’s going to be a interesting course. I thought that the class was going to deal with and discuss mental issues, but actually the class is about “mental health.” The class focus’s on how a person’s beliefs and attitudes affects things like what triggers someone to go or not go see a doctor, people adherence to medical advice, and how one reacts to and deals with illness. My two other classes are both in the Geography department. One is called, Society, Culture and Space and seems like it will be a typical sociology course, dealing with and trying to find answers behind stereotypes and stigmas in England. The other class is called Environment, Nature, and Society and really ties into the sophomore year writing class at Lafayette that I took called Agriculture, Ethics, and the Environment. I was really into that writing class, and I think a lot of the information I learned from that class will be applicable to this one. The great weather continued so yesterday the girls and I, along with four of our British friends (Angelo, Dan, Will and Josh), decided to take the train to Brighton, which is a beach town just south of London. It was an hour and a half ride and we got to the beach at 9:30 am. It was so nice to get away from the city and just lounge on the beach all day. It felt like an beautiful August day at the Jersey Shore, not an October afternoon in England! Brighton reminded me of two cities back in the States. The beach and streets surrounding the shoreline reminded me of Coney Island in New York, by the way the pier looked and the type of music that was playing. It seemed straight out of an F. Scott Fitzgerald novel. The city of Brighton looked a lot like San Francisco, with it’s big hills and winding roads. Brighton’s beach is on the English Channel so now I can officially say that I swam in the English Channel! The only thing I would change about the beach is sand, because there was none! The beach was a pebble beach and my feet are sore today from running around all day. We stayed on the beach until about 4 pm. We walked around the town and got some quintessential fish and chips before we took the train home. I have uploaded some pictures from the beach trip, so check them out!